Personally, I like green beans just fine simply steamed and dressed with loads of butter. I also like them dressed with olive oil and garlic. I don't think cooking green beans needs to be complicated. Garlic is a theme for me with green beans. If I am more ambitious than just steaming, I like them roasted with garlic. 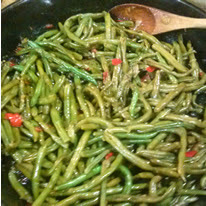 Or another favorite green bean recipe is to stir-fry them with garlic. However, no matter how I make them, hubby just didn't like them until this recipe, now he eats them! It's not particularly difficult, but must simmer for a half hour, so it fits into my repertoire best when I have just put something into the oven that will take an hour or so, like a meatloaf. It works well with ordinary whole green beans or with Romano-type green beans. Frozen beans work well too, but you really want them to be whole, not cut. Melt the bacon grease in a skillet over medium-low heat. Add onion and cook for a few minutes, until translucent but not browned. Add garlic and green beans and stir to coat in grease. Add broth, bell pepper, salt and pepper. Cover pan with lid askew to allow steam to escape. Simmer for 20-30 minutes until liquid is almost gone.